We had the most amazing foodie trip recently to LA. Starting funnily enough on the flight! We flew Air New Zealand (definite recommendation!) where we dined on a delicious meal curated by Chef Peter Gordon – is this a new thing? Hallallulia for good plane food. As soon as you step out the airport into the glorious sunshine you immediately feel like being extra healthy, everywhere you look there is a long legged blond in her running kit holding a green juice (café gratitude is the place to go apparently), we however were there to eat our way through the city and experience more than the ‘yoga bunny super green smoothie’, and goodness did we eat well. We stayed at the newly refurbished Beverly Hills Peninsula - hands down the comfiest beds we have ever slept in. The Belvedere is the hotels top notch restaurant, with head chef David Codney running the show, with ever-changing seasonal, fresh and exciting dishes. He is amazing (sorry if gushing too much) but not only did he let us cook in the kitchen with him he took us to the Santa Monica farmers market, down on Venice beach that opens early on a Wednesday morning. No wonder the city is known for its wonderful salads and healthy dishes, the produce is just amazing – surely having something to do with the weather. Wherever you look there is a famous chef picking out his tomatoes, chatting to the farmers or checking the seasonal fruit that’s there that day. Really inspiring. We ended the trip at Gjelina on Abbot Kinney for brunch – again fantastic, like really good – we went for the Moroccan baked eggs, Merguez, tomato sauce, cilantro and yoghurt and the Duck confirt-potato hash, sunny duck egg and grainy mustard. And then sadly came home to a rainy London. 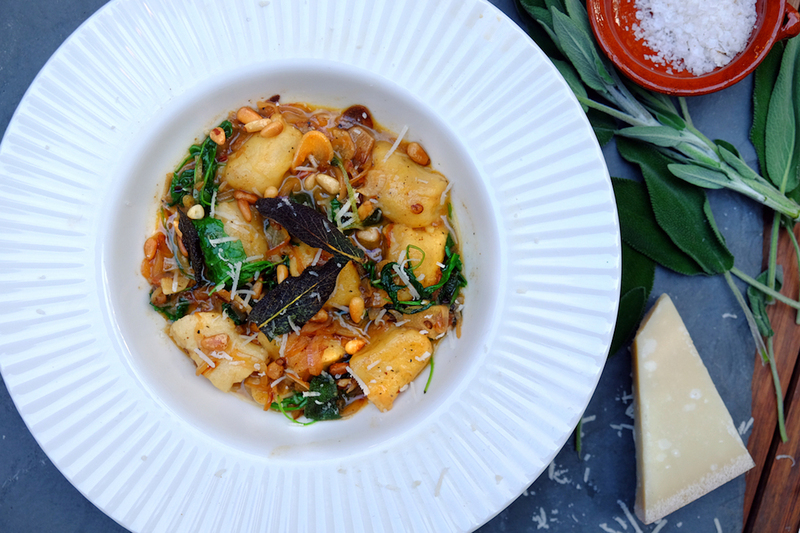 The dish that we cooked in the kitchen with David was gnocchi with pumpkin, maple and sage and was so good, here is our simpler version, very easy to make and its all about the sage. Lastly we picked up some tips from David – make the gnocchi fast while it is still hot and don’t over work. Once made you can freeze them – then cook straight from frozen! Pre heat oven to 220c 1.Place your potatoes on a pile of salt on a roasting tray put in the oven and bake for about 40 – 50 mins – till soft when prodded with a knife. Keeping the potatoes as hot as you can (we where gloves) squeeze out the filling and put through a ricer. Spread the potato onto a clean, floured surface. Then sift the flour, salt, nutmeg over the potatoes and make a well in the middle – add the egg yolks. Start to mix together and kneed into a soft dough till smooth – do not over work. Divide dough into 8 pieces, roll each piece into a sausage and cut into 1 inch pieces. Bring a pan of salted water to the boil. 2. Melt the butter in a medium sized pan, add the shallots, garlic and dried chilli and sauté for a few mins then add the sage leaves and let them crisp slightly. Add the wine and simmer for 2 mins then add the rocket and season. 3. Add the gnocchi pieces to the boiling water and cook for 2 mins – once they are floating they are ready (do in batches, if made too much don’t cook them but save them in the fridge or frezzer for a later date). 4. spoon the gnocchi into the shallot and sage mixture and stir gently. 5. serve onto warm bowls with grated parmesan and toasted pine nuts on top.